We're planning to haul LightSpeed out for new anti-fouling bottom paint here in Fiji, but it's a bit of a project. Fortunately, the Royal Suva Yacht Club (RSYC) has a slipway that with a bit of modification should easily haul our 42' long by 24' wide by about 16,000 lbs (fully loaded) catamaran. According to LightSpeed's designer Chris White, when new our boat came out of the Lombardi Yachts yard just weighing 13,000 pounds. What the boat weighs fully outfitted for cruising is a bit of a mystery, but we can approximate the weight by measuring our under-wing clearance and comparing this measurement to the designed under-wing clearance. It's my understanding that each inch of immersion is around 1200 pounds and since we are about 2-1/2" deeper in the water I can guess that we have about 3000 pounds of gear, water and fuel aboard bringing our total weight to 16,000 pounds or 8 tons. The RSYC say that they can handle up to 50 tons on the marine railway, so for us it's the form factor of our wide hull vs the standard v-hull pleasure boat that the slipway was designed for. 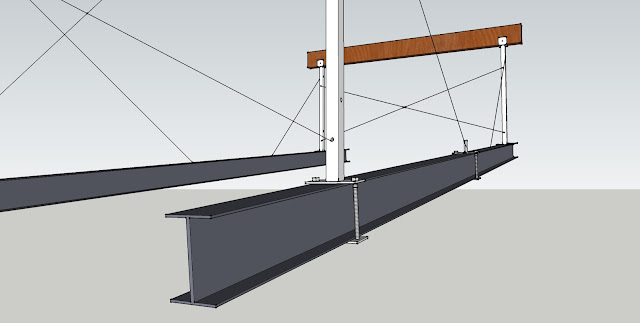 In the past catamarans have utilized a few large beams laid athwart (across) the slipway rail car and the catamarans weight was concentrated on their keels. 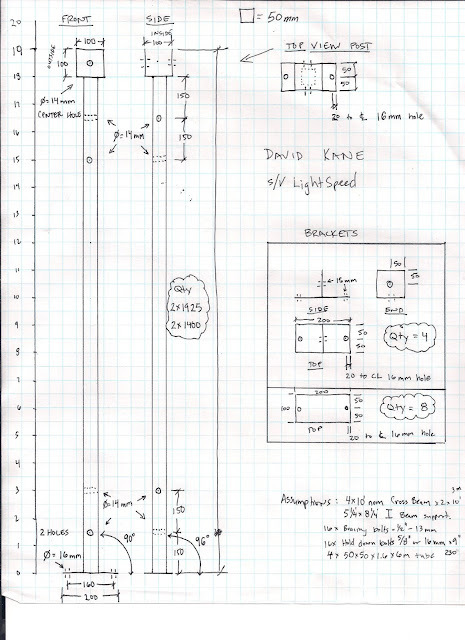 I prefer to support LightSpeed via her under-wing at her strong points where the large cross beams are located. The advantage to lifting LightSpeed by her under-wing is the easy and complete access to the underwater portion of the hulls, as hulls and keel are not encumbered with blocking supports. Atlantic 42 LightSpeed unwing blocking. Note: We added blocking under the keels and a few conventional jack stands on the hulls to stabilize the boat as this setup was pretty sketchy with no diagonal bracing. 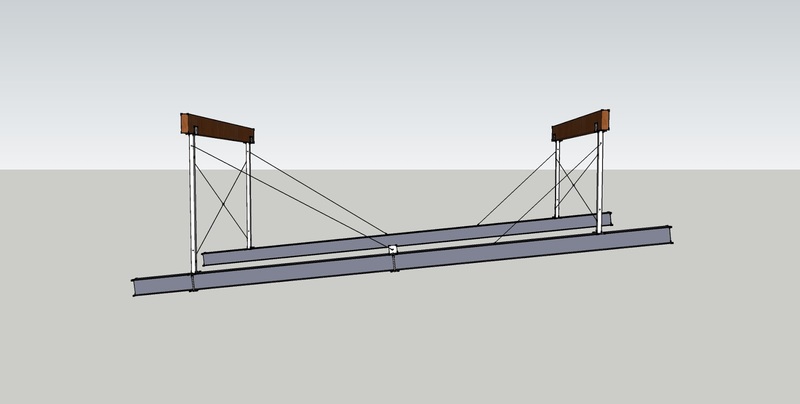 To achieve the objective of supporting LightSpeed on her undewing here at the RSYC slipway we'll need to fabricate some supports to temporarily modify the marine rail car. 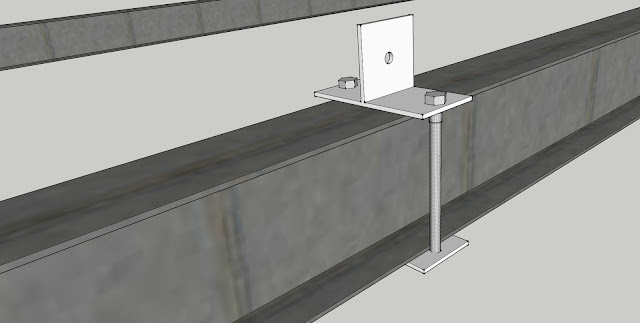 I'm not allowed to drill holes in the existing rail car or weld on new bits, so I'll utilize some long bolts and clamp my support posts and bracing points to the primary structure of the rail. 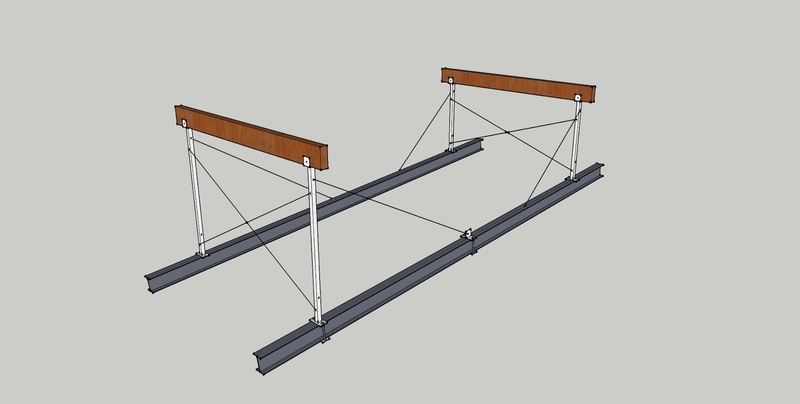 The below illustrations show the two 5-1/4" x 8" x 23' long 'I' beams that make up a portion of the slipways rail car and a simplified schematic of the proposed support posts and cross beams. For clarity, bracing is indicated by simple lines. I used Google Sketch up to quickly create this drawing, but CAD drafting is not my specialty so these drawings are schematics at best. Isometric showing posts, beams and bracing lines. 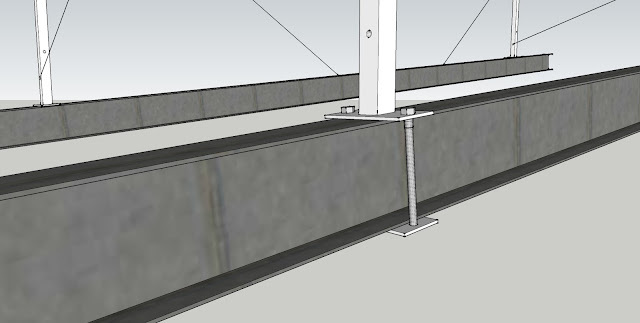 The rail is on a 10% slope as show in this side view. Support post clamping arrangement. I may add some blocking in the 'I' beam web. A view from the waters edge looking up the railway. 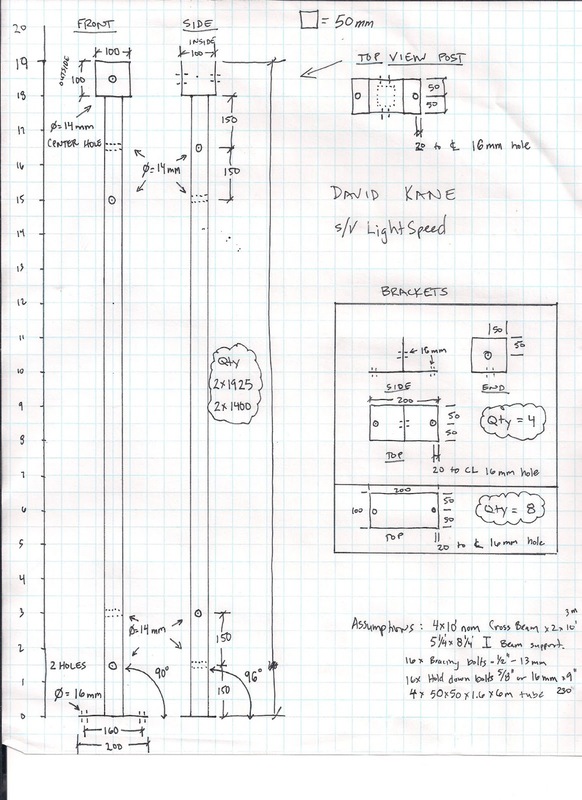 Preliminary fabrication plans. I'll be working with my fabricator to select appropriately heavy materials from available stock, so the design is liable to change a bit.